Jatinder Singh, representing Moonee Valley at a Mid-Year Cricket Association match against Strathmore Heights on Saturday, was given out, bowled, even after the bails were not dislodged. The middle stump was completely uprooted, but the umpires were left stranded, seriously considering whether to give out or not out as the bails remained serenely perched in their grooves on top of the two undisturbed stumps, seemingly wedged together in the middle. "You probably couldn't do that again if you tried. We weren't sure if maybe (the stumps) were put it at a slight angle so there was just a little bit of pressure. When they were sitting on the stumps, they were in the grooves. It wasn't like the middle of the bails were above the stumps or anything. The ball had to have hit at the exact right point that the stump didn't fly up, it went down." According to Law 28 of Marylebone Cricket Club’s Laws of Cricket, “the disturbance of a bail, whether temporary or not, shall not constitute its complete removal from the top of the stumps”, which means that even if the bails had moved, it does not necessarily mean it is out.bails had moved, it does not necessarily mean it is out. The laws of cricket can be confusing sometimes. And for that, we have the MCC-produced Tom Smith’s Cricket Umpiring and Scoring spells, which has a more detailed description. In accordance with this book, if both bails remain ‘on top’ of the stumps, or if any part of a displaced bail is above unbroken stumps, the stumps are not deemed to be ‘down’. In this case, both the bails remained on top of the stumps; they were not displaced and technically, they were above unbroken stumps. 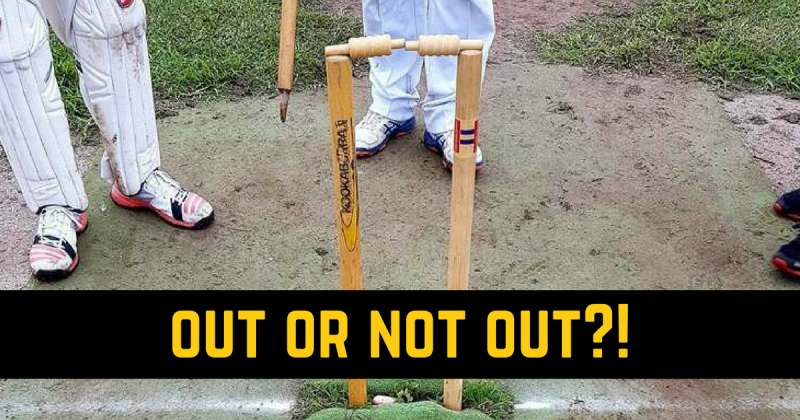 This is what caused the confusion amongst the umpires and the players. This is why Singh stood his ground even after his middle stump had been sent flying. However, as the stump had been completely uprooted, he really had no case. In the end, though, his team won the match as they chased down 196 with four wickets to spare. Last summer, a not-too-dissimilar incident took place in a U-17 Geraldton Junior Cricket Association match. At that time, a Bluff Point/Champan Valley batsman, Jacobi Unbehaun was incorrectly adjudged out. His timber had been rattled and one of the bails were dislodged but instead of falling off, it stayed in the groove above leg-stump. This is one those gravity-defying moments where everyone is left shocked. It is not often that you have the umpires seriously contemplating the decision despite having your middle stump uprooted. Imagine the plight of the umpires. Thankfully, they gave the right decision in the end.